Thursday, September 17 at the Just Cavalli boutique in the Aventura Mall, Maya Ezratti, Lauren Geduld, Lauren Kessler-Philolius host a special event benefiting the Aventura Turnberry Jewish Center on (suite #139, first floor) from 7 to 9 PM. A portion of the evening’s proceeds will be donated to the Aventura Turnberry Jewish Center. An exclusive Pre-Shop will take place an hour prior to the VIP cocktail (6 – 7 PM). 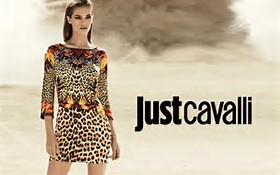 The guests who attend the Pre-sSop hour will have an exclusively opportunity to win a Just Cavalli shopping spree valued at $1,000. Two winners will be chosen at the end of the evening. To RSVP, please email justcavalli@thepattongroupinc.com. 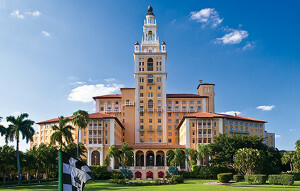 Florida Introduces Physical Activity and Nutrition to Youth (FLIPANY), will be hosting Chefs Up Front Miami, the 3rd annual gastronomical experience for the Miami community, at the Biltmore on Friday, September 18, 2015. Internationally renowned chefs will be creating a customized five-course signature meal for groups of ten at their own table. Each menu is exclusive to that table as it represents each chef and their restaurant. The event benefits Cooking Matters™, a program that teaches children and their families how to make healthy food choices, cook healthy meals and shop for nutritious foods on a budget. FLIPANY is the only agency in South Florida providing the national Cooking Matters program, created by Share our Strength’s No Kid Hungry campaign. All money raised from the events supports Cooking Matters™ for schoolchildren and their families in Miami-Dade, Broward, and Palm Beach County. Over the past three years Bobby Radical has been compiling the Making of South Beach film documentary; there have been several pop up reunions, fund raisers and great friends that have come together for this documentary. On Friday, September 18, join the Clevelander Reunion’s Facebook group to celebrate all those who made South Beach back in the day. Radical has rounded up all the old school DJ’s and live acts that are still together to create an epic event that kicks off at the Forge. 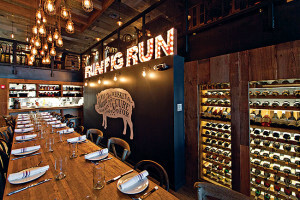 A pre-fixed 3-course dinner will be available with an optional $50 bottle of Veuve Clicquot. The fun continues on Saturday’s main event at Toe Jam and concludes on Sunday with Albion’s iconic pool party featuring a set by the late great DJ Mark Leventhal’s son Kyle. Holly Leventhal Bagdashian and Jody McDonald hosts of the Original Aqua Cafe Tea Dance for the early 90’s, return for ‘The Last Dance Tea’ Adora and Shelley Novak, both South Beach drag queen legends will perform and if you’re lucky maybe a cameo by Maryel Epps; for more information visit: www.MySouthBeachReunion.com or www.TheMakingofSouthBeach.com. 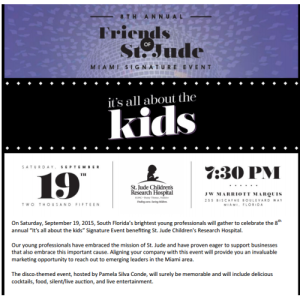 Friends of St. Jude (FOSJ) Miami, the young professionals group dedicated to raising awareness and funding for St. Jude Children’s Research Hospital®, and chaired by Jeb Bush Jr., invites the South Florida community to the eighth annual International Dermatology “It’s All About the Kids” signature event, presented by the Andrés Asion Foundation. In honor of Childhood Cancer Awareness Month, this year’s event will be held at 7:30 p.m. on Saturday, September 19, at the JW Marriott Marquis in Downtown Miami. The event will feature a tasting menu and cocktails, as well as music by DJ Pete Diaz. This year’s hosts include Telemundo’s very own, Jorge Bernal, known as “Mr. Check it Out,” and Fusion’s Nando Vila, co-host of “The Soccer Gods.” The evening’s enticing live auction will be conducted by Ashley Morrison from Miami’s local FOX 7 news station and Keith Jones from NBC 6. Individual tickets are $175 for members and $200 for non-members, and can be purchased online at stjude.org/itsallaboutthekids or by calling (305) 265-1371. To follow the event conversation online, use the official hashtag: #FriendOfStJudeMiami. Swine Southern Table & Bar will be offering a preview of its new fall menu at their inaugural gathering for the Let’s Eat Dinner Series on Tuesday, September 29 at 7:00pm! At $ 70 per person, the evening will begin with cocktail hour featuring hors d’oeuvres and spirits, followed by a 3-course dinner showcasing dishes from the new fall menu. 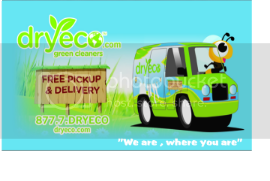 For reservations, guests may call 786-360-6433. Additionally, Swine is excited to announce that it will now be serving Lewellyn’s Fine Fried Chicken, the popular dish from sister restaurant Yardbird Southern Table & Bar. This famous fried chicken will be available every night for supper starting at the Let’s Eat Dinner. Every month, when the sky is darkest, 1 Hotel South Beach turns the lights down low for an evening of candlelight to reduce its impact, raise awareness for global light pollution, and honor the celestial cycles of the planet. 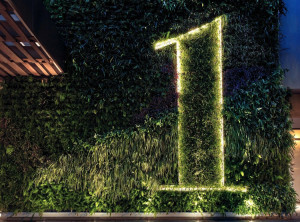 In order to create the perfect atmosphere for the eco-chic event, the lights throughout the lobby and front desk area were lowered, candles and lanterns filled the space and the living Moss Art Wall featured a projection of the earth. Mark your calendars! Dark Sky will also take place on Monday, October 12, Wednesday, November 11 and Friday, December 11. You Can’t Beat the Food at M.E.A.T.